The health insurance marketplaces created under the Affordable Care Act (ACA) have weathered several years of volatility and uncertainty. Following a tumultuous 2017 marked by Congressional “repeal and replace” debates, important administrative changes, and the termination of cost-sharing reduction payments to insurers, Michigan and other states experienced steep premium increases for 2018. 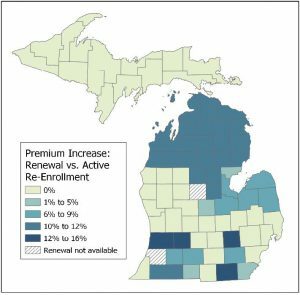 One year later, premiums in Michigan’s health insurance marketplace have stabilized, with increases for 2019 far lower than they have been in recent years. Michigan also experienced its first new insurer entering the market since 2015. With financial assistance tied to premium levels, low premium increases for 2019 mean that some individuals will experience changes in the amount of financial assistance they receive to purchase Marketplace coverage, so consumers should compare plan options, pricing, and benefits carefully to find coverage that meets their needs. Premium increases for 2019 are substantially lower than premium increases in 2018. Across all counties, the average premium increase for the lowest cost and second-lowest cost silver plans is 0.6 percent and 1.5 percent, respectively. Premiums for the lowest cost bronze plan increased by 1.5 percent, and premiums for the lowest cost gold plan decreased by 0.2 percent. Michigan continues to have a robust Marketplace. Nine insurers are participating in the health insurance marketplace in 2019, an increase of one from 2018. The new insurer, Oscar Insurance Company, offers coverage in five Southeast Michigan counties. All of Michigan’s 83 counties have at least two participating carriers. Michigan consumers can select from a variety of Marketplace plans. There are 12 to 57 plans offered in each of Michigan’s 83 counties. The 2019 Marketplace Open Enrollment Period remains the same length as it was for 2018: 45 days, beginning November 1 and ending December 15. Federal financial support for Michigan Navigators to help with open enrollment has been reduced by 51 percent, from $627,958 in 2018 to $309,111 in 2019. This is the second year in a row of substantial funding reductions for the Navigator program: from 2017 to 2018, Michigan’s Navigator funding decreased by 72 percent, from $2,228,692 in 2017 to $627,958 in 2018. On November 1, 2018, Michigan’s health insurance marketplace launched the sixth annual open enrollment period which runs until December 15, 2018. During open enrollment, Michigan residents can shop for available health plans and check eligibility for financial assistance to decrease the cost of coverage for 2019. Compared to the last open enrollment period, the Michigan marketplace has seen an increase in the number of carriers offering plans, with one new carrier, Oscar Health, entering the market in five counties. In certain areas, there are also changes in premium costs and in the number and type of plans being offered, though in general these changes are not as dramatic as in previous years. will occur on December 16, 2018. In addition, changes to benchmark plans directly affect premium tax credit amounts, so many enrollees will need to balance potentially higher costs for renewing their 2018 plan with other important considerations, such as the breadth of available provider networks. Prior to the 2019 open enrollment period, Congress and federal agencies took several actions that may impact pricing and enrollment in Michigan’s Health Insurance Marketplace. While the magnitude of these impacts may not be felt for several years, they could potentially contribute to changes in Marketplace enrollment over time. The ACA provision known as the individual mandate requires individuals to carry a minimum level of health insurance coverage. Previously, individuals who opted not to enroll in health insurance coverage were required to pay a monetary penalty when filing taxes. In 2017, this penalty was $695 per person or 2.5% of income over $10,000, whichever was greater. However, in December 2017, Congress passed the Tax Cuts and Jobs Act of 2017, which repealed the monetary penalty associated with the individual mandate. While the mandate itself remains in effect, individuals who are uninsured will no longer be required to pay the individual mandate penalty when filing taxes. In October 2018, just prior to the start of the 2019 open enrollment period, the U.S. Department of Health and Human Services and Department of the Treasury announced two regulatory changes that may change Marketplace dynamics in future years, and could have some impact on future rates. These changes include a proposed rule to expand availability of health reimbursement arrangements (HRAs), and new guidance to states seeking waivers of certain ACA rules under Section 1332 of the law. The HRA proposed rule would allow employer-funded HRAs to be used to pay for premiums and other cost-sharing in individual market coverage, potentially causing an increase in individual market enrollment as more employers offer these types of arrangements to their employees. The rule will be finalized following a 60-day public comment period and will not take effect until plan year 2020. The new Section 1332 waiver guidance has the potential to weaken consumer protections for individual market coverage. Under previous guidance, states could apply for permission to waive certain requirements of the ACA in order to implement alternative coverage systems, as long as that system advanced the overall goals of the ACA and complied with “guardrails” to ensure coverage is as comprehensive, affordable, and enrolls as many individuals as Marketplace coverage would be in the absence of the waiver. The new guidance relaxes those guardrails so that states could, among other options, provide coverage that is less comprehensive or less affordable than ACA coverage. The guidance takes effect immediately, but its impacts may not fully be understood until future state waivers are approved under the new guidance. Nine insurers offered coverage in the Michigan Marketplace in 2019, an increase of one insurer from 2018. Oscar Insurance Company, a new entrant to the market, offered coverage in five counties in Southeast Michigan: Livingston, Macomb, Oakland, Washtenaw, and Wayne. In contrast to the past several years, no carriers exited Michigan’s Marketplace from 2018 to 2019. Marketplace offerings in Michigan remain very competitive in many counties for 2019. All 83 Michigan counties have at least two carriers offering plans on the Marketplace. The number of county-level plan offerings ranged from a low of 12 plans to a high of 57 plans (see Figure 2). Ionia County had the largest net decrease in the number of available plans, from 42 plans in 2018 to 35 plans in 2019. 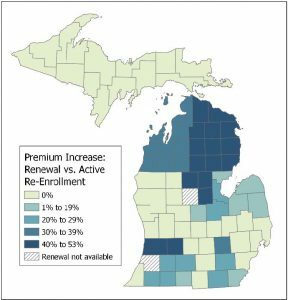 Washtenaw County had the largest net increase in the number of available plans, growing from 35 to 41 plans. Full details are available in Appendix 1. 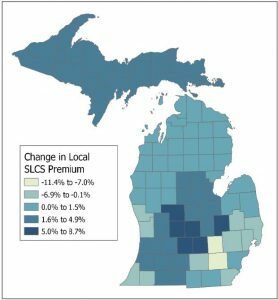 2019 premiums will increase an average of 1.5 percent statewide for the local benchmark (second lowest cost silver or SLCS) plan.6 However, premium changes vary greatly by county (see Figure 3). Benchmark plan premiums increased in 71 of 83 counties and decreased in 12 counties. The range of benchmark premium shifts varied from an 11.4 percent decrease (Livingston County) to an 8.7 percent increase (Genesee County). Full details are available in Appendix 1. From November 1, 2018 until December 15, 2018, many consumers currently enrolled in coverage through Michigan’s health insurance marketplace can renew their 2018 plan to maintain uninterrupted coverage for 2019. On December 16, 2018, returning consumers who have not yet actively selected 2019 coverage will be auto-enrolled in their 2018 plan. Certain enrollees may face higher premium costs if they stay with their current plan, due to several factors that affect premiums and premium tax credit amounts, and will need to balance these premium increases with other considerations, such as determining the provider network that best suits them. Benchmark premium: If the cost of the local benchmark plan increases from one year to the next, the enrollee’s premium tax credit will increase. Age: Premiums are adjusted by age. As an enrollee gets older, their premium tax credit will increase. Income: An enrollee with higher income faces greater expected premium contributions and will receive lower tax credits, if any at all. Premium tax credits are available for enrollees whose household income is between 100 and 400 percent of the federal poverty level. Household size: Expected premium contributions are also based on the enrollee’s household size. If an enrollee added a dependent during the year (e.g., a newborn child) their premium tax credit would increase, all else equal. While premiums for the lowest cost and benchmark silver plans did not increase dramatically from 2018 to 2019, the substantial price increases experienced from 2017 to 2018 may still impact individuals who are eligible for premium tax credits, as well as those who are ineligible for financial assistance because gross premiums are still significantly higher than they were in 2017. Because premiums for the lowest cost and benchmark silver plans increased substantially from 2017 to 2018, many Marketplace enrollees who qualify for premium tax credits experienced large increases in their premium tax credit amount. However, smaller benchmark silver premium increases (or, in some counties, premium decreases) from 2018 to 2019 translate to smaller increases or decreases in premium tax credit amounts. In 2018, the second-lowest cost silver premium was $425/month, and this individual would have received an $80 monthly premium tax credit. In 2019, there is a new second-lowest cost silver plan with a premium of $376/month, so this individual would have received a $47 monthly tax credit. In this instance, if the individual actively switches to the new second-lowest cost silver plan, their net premium will end up lower in 2019 than in 2018. However, if they remain enrolled in their 2018 plan, their net premium will be higher in 2019 than in 2018. Tax credits are calculated based on the cost of the local benchmark silver plan, but enrollees may apply their tax credits to any non-catastrophic plan offered on the Marketplace. Some consumers may choose to enroll in a bronze plan, which would have higher cost-sharing than silver plans but substantially lower premiums after tax credits have been applied. Depending on their age and income, some enrollees may receive tax credit amounts that are large enough to cover the entire monthly premium cost for the lowest cost bronze plan offered in their area. Alternatively, consumers could use their tax credit to enroll in a gold plan, which would have slightly higher premiums than local silver plans but lower deductibles and cost-sharing. In 19 of 83 counties, unsubsidized premiums for the lowest cost gold plan are lower than unsubsidized premiums for the lowest cost silver plan. In these counties, consumers can enroll in a gold plan for a lower monthly premium than if they had enrolled in the lowest cost silver plan—regardless of whether or not they are eligible for tax credits. Since local benchmark plans are changing in most Michigan counties for 2019, premium tax credit amounts may also change for many enrollees, even if their income and household size remain constant. Figures 4 and 5 provide examples of the effective premium rate increases (after tax credits are applied) enrollees may face if they renew their 2018 plan, instead of actively enrolling in a new plan. We model the effects for enrollees who selected their local lowest cost silver (LCS) plan in 2018. According to Avalere Health, LCS plans have been among the most popular plans in the federally-facilitated marketplace.9 The local 2018 LCS plan was discontinued in two counties in Michigan for 2018, while the local 2018 LCS plan remains available for renewal in 81 counties. LCS plan discontinuations are much lower in 2019 compared to 2018, when the local 2017 LCS plan was discontinued in 44 counties. As Figures 4 and 5 show, rate increases for renewing a 2018 LCS plan compared to selecting the new local LCS plan vary by county. The magnitude of these increases varies depending on the enrollee’s characteristics, but is greatest for older enrollees with lower incomes. While some enrollees may experience significant premium savings if they switch plans rather than stay in their 2018 plan, premium costs are just one of many considerations when selecting a health plan. This individual’s income is at 330 percent of the federal poverty level, and she would have received a premium tax credit in all 83 counties in 2018. In 2019, this individual would receive a tax credit in 81 of 83 counties. While she would receive a larger tax credit in 2019 compared to 2018 in 77 counties, her tax credit would decrease in 31 counties (including the two counties where her tax credit would decrease to zero). In all 83 counties, this individual’s tax credit would not be large enough to cover the entire monthly premium for the lowest-cost bronze plan offered in that county. In 19 counties, this individual could choose the lowest cost gold plan and pay less in monthly premiums than she would for the lowest cost silver plan in that county. In 30 counties where renewing the 2018 LCS plan is an option, the individual would pay at least 10 percent more for renewing, compared to selecting the new LCS plan. In 12 counties, the difference would be less than 10 percent, and there would be no difference in 39 counties. In two counties, there is no option to renew the 2018 LCS plan. Full details are available in Appendix 3. This individual’s income is at 247 percent of the federal poverty level, and therefore the individual would have received a tax credit in every county in 2018. For 2018, this individual’s tax credit amount would increase in 80 counties and decrease in three counties. In addition, this individual would qualify to receive additional cost-sharing reductions if she enrolls in a silver plan. In 62 counties, this individual’s tax credit would be large enough to cover the entire monthly premium for the lowest cost bronze plan offered in that county. In 19 counties, this individual could enroll in the lowest cost gold plan and pay less in monthly premiums than she would for the lowest cost silver plan in that county. In 33 counties where renewing the 2018 LCS plan is an option, the individual would pay between 20 to 50 percent more for renewing, compared to selecting the new LCS plan. In two counties, the difference would be more than 50 percent. In seven counties, the difference would be less than 20 percent. There would be no difference in 39 counties. There is no option to renew the 2018 LCS plan in two counties. Full details are available in Appendix 3. 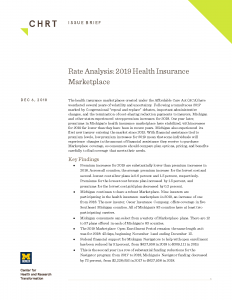 Michigan consumers continue to have a robust choice of carriers and plans on the Health Insurance Marketplace in 2019. Premiums increased modestly across the state in 2019, and consumers in some areas experienced premium decreases. Premiums and tax credit amounts change every year, so consumers should compare their options carefully, as cost-sharing and tax credit amounts varied substantially from 2018 to 2019. Michigan residents can enroll in 2019 Marketplace coverage until December 15, 2018. Plans are assigned metal levels of bronze, silver, gold, and platinum that have actuarial values of 60, 70, 80, and 90 percent, respectively. Plans at higher metal levels generally have higher premiums and lower cost-sharing. All analyses were completed using 2018 and 2019 individual market medical plan data available at data.healthcare.gov. Federal Subsidies for Health Insurance Coverage for People Under Age 65: 2018 to 2028, Congressional Budget Office, May 2018: https://www.cbo.gov/system/files/115th-congress-2017-2018/reports/53826-healthinsurancecoverage.pdf (accessed 10/31/18). K. Pollitz, J. Tolbert, and M. Diaz, Data Note: Further Reductions in Navigator Funding for Federal Marketplace States, Kaiser Family Foundation, Sep 2018: https://www.kff.org/health-reform/issue-brief/data-note-further-reductions-in-navigator-funding-for-federal-marketplace-states/ (accessed 10/30/18). Plan offerings do not include catastrophic plans or child-only plans. Statewide unweighted averages are based on a 40 year old nonsmoker purchasing the second-lowest cost silver plan. The amount of the premium tax credit received by an enrollee is determined by subtracting the enrollee’s maximum premium contribution from the age-adjusted premium for the local benchmark plan in the enrollee’s region. The maximum premium contribution is a product of the enrollee’s household income and the “applicable percentage” of their income they must contribute, a sliding scale that ranges from 2.01 to 9.56 percent of income for those between 100 and 400 percent of the federal poverty level. A Brief Analysis of the Individual Health Insurance Market, Mark Farrah Associates, Aug 2018: https://www.markfarrah.com/mfa-briefs/a-brief-analysis-of-the-individual-health-insurance-market/ (accessed 11/16/18). E. Carpenter, Avalere Analysis: Most Popular Exchange Plans Are Increasing Price, Avalere, Nov 2014: http://avalere.com/expertise/managed-care/insights/avalere-analysis-most-popular-exchange-plans-are-increasing-price (accessed 11/3/18).